I am always amazed to watch the vendors at the Tucson Gem & Mineral Show. Literally millions of crystals and minerals are shipped into Tucson. Each one of those crystals is individually wrapped, then it is individually unwrapped, and then a customer buys it, and it has to be wrapped again. Then, one way or another, the crystal has to be transported to the retail place of purchase, where it is unwrapped again. Once the retail customer buys the crystal, yet again, the crystal has to be wrapped and transported to its new home. All that wrapping and transportation does boggle the mind if you think about it, but that is not the part I find amazing. The part that I find amazing is the care with which each person who handles the stone puts into the wrapping and unwrapping – no matter how small, no matter how rough, every stone is treated with respect. The care of your crystals begins from the moment you select them at the place of purchase. Ensure that they are appropriately wrapped and then take good care of the package itself, because if the package gets damaged, there is a good chance that the contents will get damaged. Now everything I am saying here may seem obvious, however I have seen horrible accidents with my own eyes. I have seen beautiful crystal tools roll off surfaces, crash to the ground and break, and I have seen a customer place her brand new, custom-made wand in her big bag with one end protruding, walk down the hall, catch the wand on the bannister, and break off the end of the wand. Problems arise when we are in a hurry, when we are fatigued, and when we skip steps. Hopefully these words will imprint themselves on you, and you will remind yourself always to slow down and be thorough when packing your crystals. I am not tidy by nature, but crystals have transformed me. Once I slowed down, and stopped resisting the seemingly arduous process of packing and organizing my new crystals, I began to feel a new layer of interaction with my friends. I could feel an emanation of appreciation and communication that is intensely rewarding. Consequently, I’ve gone from someone who hates packing, organizing and tidying to someone who loves the feeling of getting everything organized and displayed in a way that makes me feel good. There is no 2 ways about it – I learned this from the crystals. Crystals are the way they are because of their precise geometric structure. Crystals are inherently organized and focused. That is their identity, their essential nature. Consequently, they prefer to be arranged in an orderly manner that shows off their beauty. Crystals like to be admired and they love to be talked about – just like dogs and cats! Crystals also like to feel safe. Don’t put them in places where they can easily fall over, be knocked down or get damaged. Particular care needs to be taken with stones that can roll easily. It is so sad to see these lovely items get damaged. 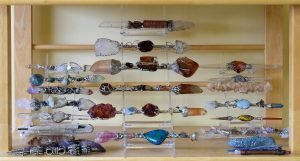 My work crystals are all carefully arranged so that I can see them whilst working, and receive any messages they are trying to send me. The terminations all face the same way. Each one has its place on the shelves, and after use, the crystal must go back to its home. This way, I know exactly where my crystals are, and I can find them easily and without wasting time looking for them. I allow many different people to teach classes in my space. About ten years ago, a guest teacher ran a weekend workshop at FourWinds Academy, and when I walked into my room, instead of the usual soft and relaxed atmosphere, I could feel a distinct sense of tension and unease. “That feels wrong!” I thought to myself. I noticed that my crystals had been moved around and that most of the terminations were pointing in the wrong direction. I immediately began the process of moving the stones back into their ‘home’ positions, and redirecting the terminations. This felt very soothing. My assistant had been at the workshop, and had seen everyone picking up the crystals and moving them around. 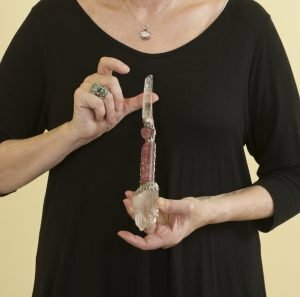 One woman, who was grieving her recently deceased daughter, had actually broken 2 of my tools – an orange calcite wand, and a deep pink, rubellite tourmaline that was one of my most valuable stones. Everyone felt awful – the grieving woman, my assistant and the guest teacher, as well as the calcite wand and the rubellite tourmaline. I “allowed” these 2 lovely tools to remain broken for a long while, in honor of a mother’s broken heart, and then I asked my friend Scoop, of Magical Delights, to build the tourmaline into an extra special wand, with a cathedral quartz on one end, and a lightning struck quartz on the other end. The tourmaline acts as the “heart” of the wand, each of the pieces separate, yet united forever, in the same structure. I keep my work crystals at work, and my personal crystals at home. I have only a few crystals that I use for both purposes, so few that I can only think of one right now. One of the reasons for keeping them separate, is that crystals become programmed according to the way we use them. Consequently, crystals that we are using for ourselves are ready prepared, vibrating at the frequency that best affects us personally. There are many ways to clean crystals. The safe and efficient way to do this, is to beam light through the crystal with the intention of clearing the energy of the crystal. You can either project this energy from your third eye, or, you can project the energy through your thumb and fingers as you pick up the stone (after use) and replace it in its home. When crystals get dusty, you can wash them under the faucet. Holding a crystal under running water is a great way to clean it. BUT there is a caution here: some crystals are water soluble and if you get them wet, they will dissolve. The one that most rapidly comes to mind, is halite. So, BEFORE WETTING CRYSTALS CHECK whether it is OK to get that particular mineral wet. Here are 2 ways to “deep clean” crystals: The first is to bury them in uncooked rice, and the second is to soak them in a solution of baking soda – 1 tsp of baking soda to a half gallon of water. Once again, do not soak a crystal that will dissolve in water. The baking soda solution is very good at cleaning crystals both metaphysically and physically. Crystals are cleaned with acids, and soaking in baking soda will clean the acids off the crystal, as well as clear the energy. Other ways of cleaning crystals include sun and moon bathing, and soaking in seawater. These methods do have risk and complications attached. Some crystals will fade when exposed to sunlight – amethyst, kunzite and fluorite, to name a few. The list of sun sensitive minerals is actually quite long and I personally prefer not to take a chance. Moonlight does not have that same risk, however, the moon has to be strong and bright, without cloud and tree cover, to be effective – and I’m not particularly keen on carrying my stones outside and leaving them there overnight. I have taken my crystals to the ocean to cleanse them in seawater. Fortunately I had read the caution to note in connection with this method, namely, do not just place your crystals on the sand at the edge of the tide. As the waves come in, they will tumble your stones in the sand, pull them back out and even bury them – and you will never see them again. Instead, place them very safely in a bucket of seawater. As my collection grew, it no longer seemed feasible to take a load of crystals on a trip to the ocean. I would still consider this method for a special crystal that could benefit from the unique kind of cleansing that only the ocean can offer. An example would be a crystal that is used for helping clients recover from trauma. Our crystals work very hard for us, and just as we do, they like to either “lie in bed,” or “relax with friends” to recharge their energy. The easiest way to recharge your crystals is to give them a ‘home’ position (lying in bed) and keep them in a community group (relaxing with friends.) This brings us right back to the organization aspect. 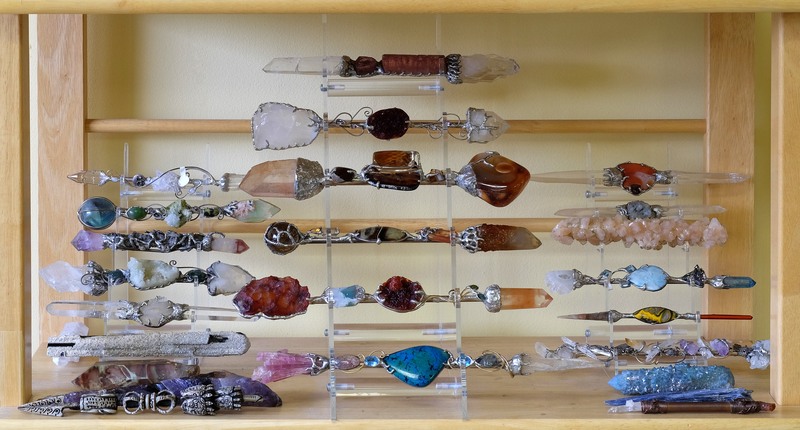 Keeping your crystals together on a shelf, in a well-organized way ensures that they are simultaneously ‘at home’ and in their community, benefiting from each others energy. Another way to recharge a crystal, especially one that you wear, is to rest it on a crystal cluster. A crystal “plate” – a flat structure that has many, many crystal points is ideal. A geode, that looks like a crystal cave, is also ideal. If you don’t have a crystal plate or geode, you can make a little bed of tumbled stones in a bowl, and pop your jewelry, or hard-working crystal, on this bed for a soothing recharge.